SINN FÉIN AND Fianna Fáil have given their viewpoints on last night’s joint statement from Taoiseach Enda Kenny and German chancellor Angela Merkel affirming Europe’s commitment to splitting Ireland’s banking and sovereign debts. In their statement, Merkel and Kenny said Ireland was recognised as a ‘special case’ because of the way it was frozen out of the bond markets, a fact which would be taken into account. They also agreed to end the ‘vicious circle’ of banking and sovereign debts. Sinn Féin’s finance spokesperson, Pearse Doherty TD said that point of the Taoiseach contacting the German Chancellor was to seek clarification of her earlier statement regarding retrospection of the arrangement whereby the ESM could re-capitalise banks directly. Clearly, Enda Kenny achieved no such clarification, but just a reiteration of the statement of 29 June 2012, which promises nothing more than a examination of ‘the sustainability of the adjustment programme’. He described the joint communiqué as showing “that no progress has been made in dealing with our debt, which is unsustainable”. Deputy Doherty added that “the sooner the government admits that and starts to act in the interests of the Irish people, the better”. Meanwhile, Fianna Fáil leader, Micheál Martin TD, said the joint statement “appears to be positive”, but he called on the Government to outline what it is actually seeking from Europe. I am glad that the Taoiseach put aside his dismissive attitude from earlier in the week and eventually telephoned Angela Merkel today to speak to her directly about the importance of Ireland’s legacy debt being examined and dealt with by the EU. Saying that the communique is “far from clear”, he described it as reaffirming the June agreement, but added: “German sources have spent the last week briefing that this agreement did not mean what the Irish Government had claimed it meant”. We need to hear, in straightforward language, what the Government is seeking and what Europe means when describing Ireland as a special case. 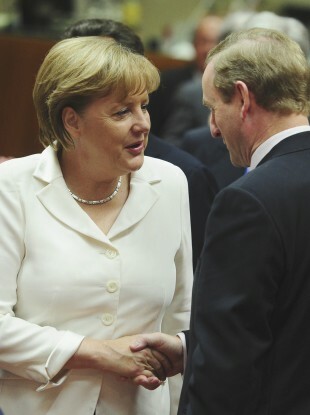 Email “Fianna Fáil, Sinn Féin call for clarification of Merkel and Kenny communiqué”. Feedback on “Fianna Fáil, Sinn Féin call for clarification of Merkel and Kenny communiqué”.